Case is ideal for protecting your Oculus Go VR Headset and accessories and is easy to transport using its convenient carrying handle. Measuring 16.0" x 13.0" x 6.0" in exterior dimensions, and internally has pre-cut foam compartments for the Oculus Goggles , Remote , Charger and a 8.0" x 7.5" customizable foam area for additional accessories. 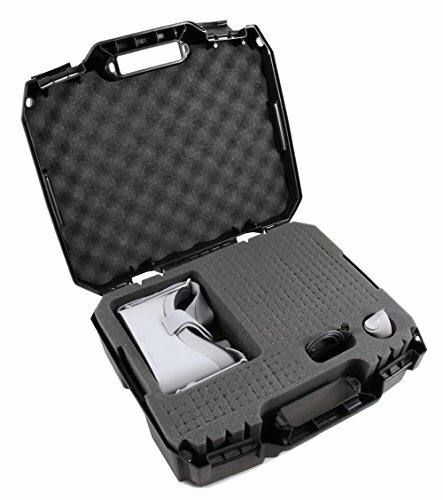 This case is perfect for securing and protecting your Virtual Reality Headset while Keeping your various accessories organized. The Middle 3.3" sock absorbing Core has impact absorbing compartments for the Ocluus Go goggles , Remote and Charger Pre Cut. Accessories can be easily stored by plucking a small customized compartment next to your Virtual Reality Goggles in the 8.0" x 7.5" Pick in Pluck Foam Area.